NOTE (October 31, 2013): The following information was presented on Willhite Seed Company's web site. It is presented here for educational and historical purposes. Parker County, Texas has been noted for its excellent quality of watermelons. It was in 1904 that this county first achieved distinction by winning first prize for both the size and quality of its watermelons at the World's Fair in St. Louis, Missouri. 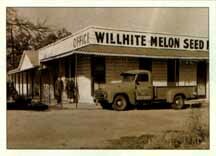 T. A. Willhite began growing melons in the 1900s around Poolville, in the northern part of Parker County. About a year later, friends suggested that he start selling seed. He sold a few melons that year and 77 pounds of seed. From that humble beginning, Willhite Melon Seed Farms began. Mr. Willhite originally operated the business in a building at his home. But, as business grew, he moved into the First State Bank of Poolville office, which had closed during bad economic times. During this time, Tom Watson and Stone Mountain were popular varieties. Mr. Willhite passed away, and his daughter, Miss Clara Lee Willhite became owner and manager in the 1940s. This was a period of growth for the company. She expanded the business not only from coast to coast, but also worldwide. She continued as owner and manager until her death in the 1960s. Upon her death, the business was acquired by two of her employees, Vaughn Mader and Gene Hodges. They continued the Willhite tradition and later sold the business to Dr. Lee C. Coffey in 1970. Dr. Coffey expanded the product line to include garden vegetables and supplies. Melon varieties continued to be developed and improved and a hybrid breeding program began. The company's name changed from Willhite Melon Seed Farms to Willhite Seed Company to reflect these changes. 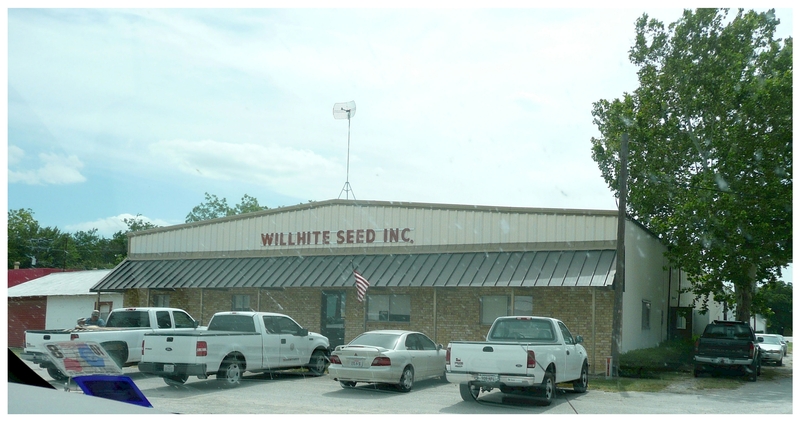 On September 1, 1994, Willhite Seed Company legally became Willhite Seed Inc. Even though we are incorporated, we are still a family owned business. Except for the departure of Dr. Lee Coffey, Willhite Seed will still have the same friendly personnel with whom you have always dealt. Our general manager, Don Dobbs, has been with the company over 40 years and has extensive knowledge of the varieties. Our office manager, Carole Clark, has almost 30 years of experience and personally tries many of the new varieties in her home garden. Many new challenges face the seed industry. With the development of genetically engineered vegetables and the occurrences of new diseases, the future is uncertain. As in the past, we will strive to offer the highest quality seed to our customers. Our goal is to continue providing the highest quality seed to our customers for the coming years. 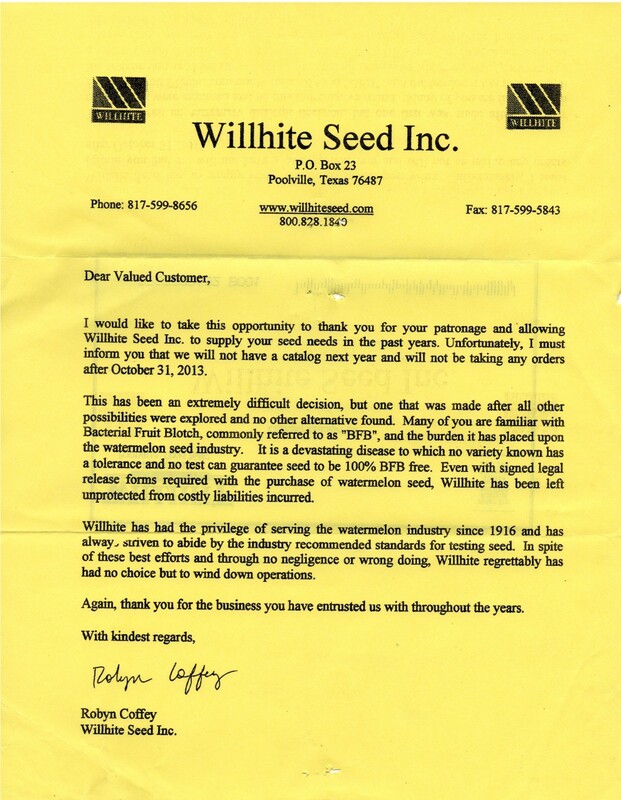 On October 22, 2013, we received notice from Willhite that they would be closing their company to sales as of October 31, 2013 and cease all operations as of November 30th thus ending a 109 year tradition of melon breeding and seed production. Click here for a copy of the letter. Postscript: Thankfully, and without explanation, they were able to resolve whatever issues caused them to make their 2013 decision, and as of this date (2014), decided to remain a "retail only" business dropping bulk and wholesale sales.